The third (and presumably last) Greg Mandel book is “The Nano Flower”. Julia Evans is puzzled to be presented with a magnificent flower by a mysterious woman at a high-class party in Monte Carlo. She is even more puzzled when the flower is analysed and her scientists come to the conclusion that it is unrelated to any flower that ever grew on Earth. She calls in Greg to investigate where the flower came from, and whether it might have any connection to her technology-obsessed husband Royan, who vanished without trace several years previously. As in the previous novel, for most of the book the science fiction content is fairly light as Greg and companions fly around Europe chasing leads and trying to avoid some nasty hitmen who seem to be after them. It gets slightly James Bond-ish in feel as Greg stumbles from one spectacular action scene to another, in a series of increasingly unlikely locations, including an airship used as a home by a wealthy businessman, and Man's first asteroid colony. In the last 100-or-so pages, the science fiction content increases as Greg encounters the source of the titular “Nano Flower”, and finds himself facing a tough decision about how to resolve a problem that could potentially harm all life on Earth. Again, the characters are entertaining, the action scenes are fun and the end of the book has some nice Science Fiction concepts. The end of the book isn't perfect (some parts of it are possibly trying to wrap every plot thread up neatly), but it is at least original, although it is disappointing that the rest of the book doesn't have such a high density of ideas as the ending. The plot may also rely a bit too heavily on coincidence, and there might be a couple too many action scenes, but other than that it is good. 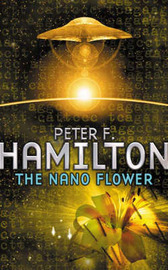 “The Nano Flower” is entertaining, reasonably original and has a fair number of interesting ideas. It may not be the best of Hamilton's work but it’s not too far away from that standard.